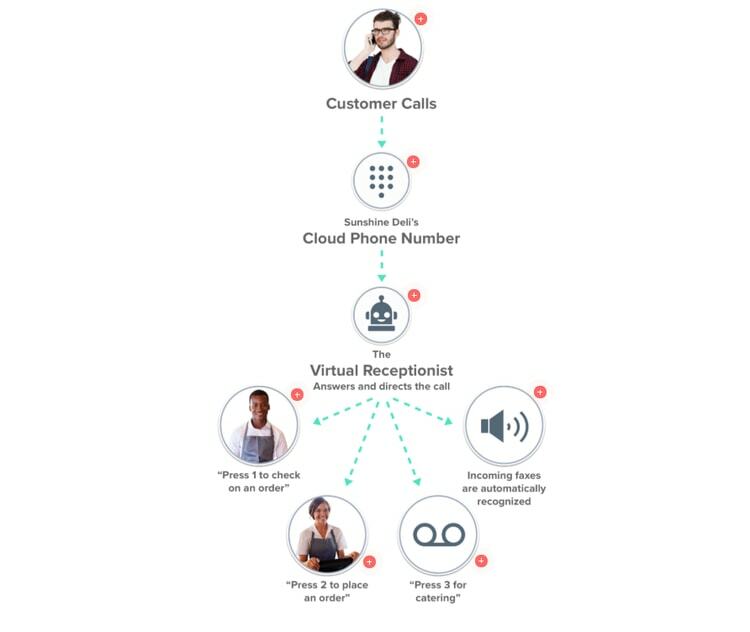 Voxox’s CloudPhone is a fully flexible VoIP communications platform that enables small businesses to unify all of their communication channels through one intuitive and powerful interface. CloudPhone is particularly designed to be organized from and through ordinary cellphones. In that vein, its iOS and Android mobile account managers allow you to quickly view how many minutes, SMS messages, credit, and extensions remain, as-well-as setting various preferences for the CloudPhone operation. You can also make phone calls from within the account manager, wherever you are, and set up call forwarding through ‘Reach Me Anywhere’ that can even redirect calls overseas. CloudPhone includes the capability to make and receive business calls and text messages as well as receiving faxes, voicemail messages in the form of emails, and managing social media networks. The CloudPhone includes multiple toll-free or local numbers, an easy-to-use account manager, and is fully mobile-friendly so that you can receive and make calls and manage usage wherever you are. CloudPhone is entirely cloud-based so the management console can integrate smoothly with existing business software, such as your PC. The web-based dedicated call management center can be controlled via the mobile app or from any computer, anywhere in the world. The CloudPhone’s central dashboard syncs data from all users within the system so that you can view overall minutes and text message usage and a breakdown of incoming and outgoing calls. The integrated conference call console gives administrators control over phone meetings. You can link all of your social media networks with CloudPhone, and connect your existing personal phone books and email contacts as well, to unite all of your communications outlets into one all-in-one platform. The CloudPhone integrates faxes as well as conference calls, video messaging, and content sharing across every device. With the integrated dashboard, you can make calls from your business phone number via your desktop, your smartphone, or any internet connected device, as well as performing sophisticated call routing between devices. Overall, Voxox’s CloudPhone is a solid product with a good value for the money. The 3 pricing plans all include unlimited minutes and SMS messages. The differences between the plans are the number of extensions, virtual receptionists, and phone numbers. The Basic and Professional plans are both very competitively priced, but the top-tier Small Business plan is currently on sale at an especially sweet half-off price, at $34.99 per month forever. Whichever plan you choose, you can add extra features that are not included, such as extra auto attendants, or extra toll-free or local number lines, for an additional cost. On top of all this, there is a 30-day free trial so you can see whether the VoIP works for you before committing to monthly payments. The mobile functions of Voxox’s CloudPhone make it a great option for on-the-move professionals. The CloudPhone’s mobile account manager can be accessed from any browser, including smartphone browsers, allowing you to check up on remaining credit, minutes, and texts and adjust your settings wherever you are. You can record calls from the mobile app and access them through the web portal as-well-as email or just by sending a text message. You can also change your billing information, contact customer support, or upgrade your CloudPhone plan through the mobile account manager. Through the mobile app, you can use your personal smartphone to make business calls with your business phone number. When you use CloudPhone through your mobile, you can access call recording, conference calls, call transferring, and business SMS messages. Conference calls via the mobile app can include up to five callers. The CloudPhone sends your business phone calls to your mobile, wherever you are, even if you are out of the country, so that you can always make yourself available to business connections. Voxox’s CloudPhone is scalable up to 10 phone numbers in the Small Business plan (which is currently half-priced). So if you end up needing more than 10 numbers in your VoIP network, you will have to find a new provider. On the other hand, with CloudPhone, you can get a lot of mileage out of those 10 phone numbers considering that they come with unlimited extensions as well as unlimited virtual receptionists. The Basic plan covers just two users with one local or toll-free phone number and is well priced for new businesses. Because no additional hardware is needed, a business can keep adding more users as it grows, just by adding their smartphones into the system. It's easy to set up so you can simply and quickly add new employees. The CloudPhone doesn’t require any particular hardware, which makes it easy to set up. Just download the app to your computer and/or smartphone and set up your account by entering a few personal details to create a profile. Once you verify your account via email, you'll be assigned a phone number to your CloudPhone line. The interface is simple and intuitive, although tech-happy users can customize just about every element of it if they choose. When you first use the app, you’ll enter a wizard to guide you through the initial configuration of all elements of the service. You will be given the option to connect your email and various social media accounts if you want to organize all of your business communications through this single service. Activity that manages all call activity including reading transcribed voicemail messages, listening to call recordings, and viewing PDFs of fax messages. Extensions, which lets you manage your settings such as caller ID, how to respond to incoming calls, and which notifications you’ll receive. Admin-level users also see a Company tab, which shows all the call, text message, and other information about all users in the system. The Voxox CloudPhone doesn’t come with any equipment because it coordinates entirely through your mobile phone and computer desktop. This is advantageous because it can slip in with your existing phone systems without requiring you to invest in any particular hardware. However, because you can’t use it with a softphone, you’ll probably want to invest in a good headset to make calls more easily through your smartphone or computer. Voxox’s customer support is available via both email – by sending in a support ticket – and phone, although neither is open 24/7. There is no live chat option. On the other hand, both email and phone support will get you through to a representative and the telephone support is available through a toll-free number. There are also 2 extensive FAQ pages, one for Voxox in general and the other relating specifically to CloudPhone. While Voxox does have a Facebook account, it doesn’t respond to customer service messages via social media. The Facebook page for Voxox seems to be used only for sharing blog posts on the Voxox blog and there is no Twitter, Instagram, or any other social media network that you can use to contact the company. CloudPhone is fully set up to handle both incoming and outgoing international VoIP calls. You can make calls to international numbers from your business telephone number through both the mobile app and web portal. Although only calls to the USA, Canada, and Mexico are included in your free minutes, you can easily see how much it will cost per minute to call whichever destination you want. CloudPhone makes it easy for you to dial the right country code – you just select the destination country from the drop-down box on the mobile app and the service fills in the correct country code for you, which saves some time and trouble. Although call quality varies depending on the country you’re calling, overall it’s clear and easy to hear. Incoming international calls are treated just the same as local calls with the option to record the call, call screening, and call forwarding features. Only local USA and Canada numbers are available as either toll-free or local options, so businesses with an international presence can’t set up local phone lines in other countries. CloudPhone excels at bringing together all your communications channels into one central place. Your business emails, texts, conference calls, incoming and outgoing calls, and even social media networks can all be accessed via the CloudPhone mobile app dashboard or web portal. CloudPhone even has the option to convert incoming faxes into PDFs which can be accessed via email or SMS message.. Video messages and IM can also be accessed and managed via CloudPhone. Overall, CloudPhone by Voxox is a highly flexible and powerful unified communications solution for small- to medium-sized businesses. The 3 pricing levels with unlimited extensions mean that even small businesses can afford enterprise-grade features without breaking the bank. Vital features like call forwarding, call recording, and conference calls are enhanced by the ability to receive faxes as PDFs to your email or text message center, and to read voicemail messages in email form. Although Voxox could do with increasing its customer support coverage so that it’s available around the clock, as well as adding in live chat, it’s already a very valuable and cost-effective communications solution. Once Voxox meets its full potential by adding a softphone integration, extending some of the best features to be accessible outside of the mobile app, and expanding the phone numbers on offer, it could rival the biggest VoIP providers.